It's been 30 years since Stephen King's novel was first adapted, and this version includes pretty much everything you want in a horror movie: freak-out atmospherics, buckets of gore, menacing forest, creepy child and doddering-but-wise neighbour. So even if it basically sidesteps any exploration of grief or family tensions, at least it keeps the viewer on edge, with a hand at the ready to cover the eyes as needed. To escape the rat race, Louis and Rachel (Clarke and Seimetz) move to small-town Maine with 9-year-old Ellie (Laurence) and toddler Gage (Hugo and Lucas Lavoie). They quickly connect with lonely neighbour Jud (Lithgow) and, when their cat is killed by a passing truck, he shows Louis an ancient burial spot beyond the town's normal pet cemetery (with its misspelt sign). Sure enough, the cat comes back, but it's clearly not happy about being alive. And when another tragedy strikes, Louis knows what he needs to do next. The script maintains some of King's trademark set-up: throwing already conflicted characters into something unthinkable. Making them messy and human helps carry the audience through each crazy thing that happens, including the seriously grisly flashbacks and visions. Although there is a nagging sense that interesting details are missing, both relating to the family's relocation and Jud's entire life. Still, there's just enough for the directors to have some fun with, merrily mixing predictable jolts with unnerving surprises. The actors are strong enough to bring these people vividly to life, although only Lithgow properly makes his character leap off the screen by revealing an intriguing, troubled inner life between the lines. Clarke and Seimetz are fine as parents grappling with huge issues that are common to a lot of people, as well as a couple that definitely are not. And Laurence is simply terrific as the strong-willed Ellie, the character that gets the most attention from both the screenwriter and the directors. Kolsch and Widmyer keep the narrative moving right along, continually adding gurgling emotional undercurrents to each scene. So even when there's a moment of levity, it's clear that something fairly awful is coming along very soon. The filmmakers make clever use of imagery and sound, often in ways that are properly nerve-jangling. Although since it never quite takes hold of the issues the story raises, the entire movie kind of feels like an extended joke. At least it has a zinger of a punchline. Stephen King writes great books (really! 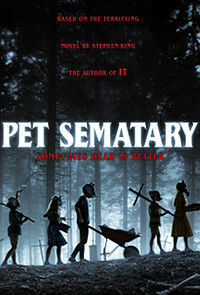 ), and Pet Sematary, in my opinion, is the scariest thing he's ever written -- a novel that makes you afraid to turn the page as you yell out loud at the characters. But it's also an examination of how hard it is to face the death of someone we love, even our dogs and cats. Unfortunately, the films of King's novels don't carry the same weight. Sure, some have been pretty good (The Dead Zone, Cat's Eye, Carrie), but most are about as bad as they come. 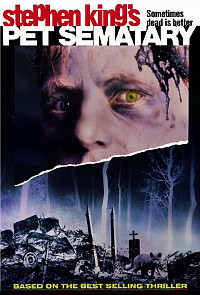 Pet Sematary ranks up there as one of the worst screen versions of a King book in memory (and one of the most financially successful, alas). Like the film version of Firestarter, it trivializes the book's reality for a cheap fright, opting for ominous background music instead of the everyday sounds that should be there. Besides, that infuriating music and some lame sound effects give away most of the good plot twists. Sadly, Stephen King wrote the screen version as well. His film track record isn't too good (did anyone see his dreadful Maximum Overdrive?). He puts truly stupid lines in the mouths of adept actors. Dale Midkiff and Denise Crosby are pretty good as the young couple who moves to Maine, then discovers a cemetery populated with pets killed by fast-moving semis along the highway in front of their new house. (Of course, it's the other cemetery -- the one with the ridiculous blue glow -- that they should watch out for.) And Fred Gwynne is perfect as the creepy neighbor across the street. Why couldn't they have made a film that retains the book's depth? About a real couple in a real place who has to come to grips with the reality of death, but can't. That's sort of here, lurking behind the goo. And Mary Lambert's direction is really quite stylish, the dreadful soundtrack aside. Sometimes read is better.